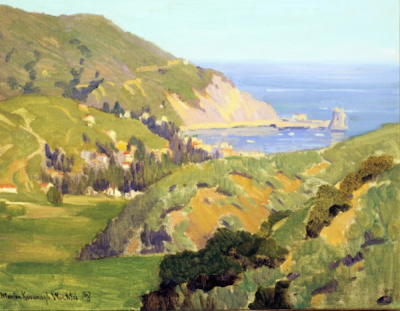 The view in this Santa Catalina Island oil sketch by Marion Wachtel is looking to the Northwest from an elevation well up the North Canyon Passage above Avalon Harbor. In the distance; across Avalon Bay; is Little Sugarloaf Point showing the first dance hall pavillion that was built in 1920. The distinctive rock formation on the point was dynamited in 1929 to make room for the now famous Grand Casino Ballroom. During the 'teens and 'twenties; the Wachtels traveled up and down the California coast; documenting their trips with numerous plein-air studies/sketches. 'Avalon; Catalina' is one of these works; This unfinished painting is interesting as it demonstrates Marion Wachtel's painting technique. She has filled the entire cnvas with the base colors and composition and was in the process of adding the details when her work on the painting terminated. It is also a relatively rare example of her work in oil during this period since; while married to Elmer Wachtel between 1904 and his death in 1929; she painted primarily in watercolor. This page was last edited on 29 April 2017, at 10:33.